The study showed that 91 percent of all residents of Crimea are generally positive about the reunion of Crimea and Russia, 5 percent said they are negative about it, and 4 percent were undecided. Over ninety percent of all residents of the Republic of Crimea are positive about the reunion with Russia that took place in March 2014, Valery Fyodorov, the head of the All-Russia Public Opinion research Center (VTsIOM), has reported. The poll was conducted by VTsIOM between February 9-18 by going door to door. The poll surveyed 1,600 people. "It's a lot of people for Crimea. We normally poll 1,600 nationwide," Fyodorov said. "The results of the study show that the people of Crimea have not changed their minds," Fyodorov told a press conference in Simferopol on Tuesday, citing the results of a study conducted in February 2015. 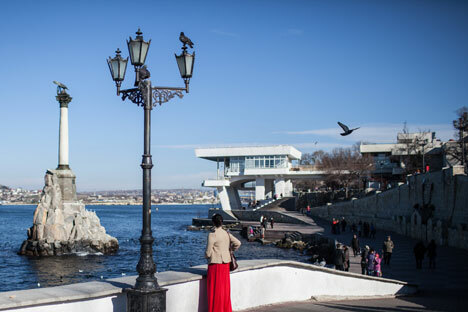 Nineteen percent of the residents of Crimea said they would vote for Crimea to join Russia, 5 percent said they would vote for Crimea to stay part of Ukraine, and 5 percent said they would abstain from voting if a referendum on Crimea took place this coming Sunday. The possible margin of error of the poll does not exceed 3.6 percent, Fyodorov said. Fyodorov also said 66 percent of all residents of Crimea believe the situation in the region improved after the reunion of Crimea and Russia. Over half of the region's residents (56 percent) tend to be positive about the process of the regions integration in Russia. Among the main problems experienced by Crimea after the reunion with Russia the respondents mentioned growing prices and inflation (79 percent), unemployment (56 percent), condition of roads (47 percent), problems with documents (41 percent), and low wages, pensions and stipends (33 percent). An overwhelming majority of the respondents (86 percent) said they are generally happy with their life. "It's a high figure, it's higher than generally in Russia," Fyodorov said. Almost half of the respondents (45 percent) said the financial situation of their families improved over the past year. Thirteen percent of the respondents said it has worsened and 41 percent of the respondents said it has not changed. Fyodorov said the only ethnic group in Crimea that is divided on the issue of the reunion of Crimea and Russia is Crimean Tatars. Among the respondents who stated their ethnicity as "Crimean Tatar," 49 percent said they would back the reunion of Crimea and Russia if the referendum was held on the coming Sunday and 26 percent said they would vote for the region to stay part of Ukraine. The poll results, which are possessed by Interfax, indicate that the people of Crimea are highly positive about the work of Sergei Aksyonov, the head of Crimea (86 percent of the respondents spoke positively about his work and 6 percent spoke negatively about it). Over half of Russians (52 percent) are confident that the Crimean independence referendum was an exclusive initiative of the Crimean administration. Who lives in Crimea? What language do they speak? Why are there so many Russian troops there? The situation in Ukraine is particularly painful for many ordinary Russians because the two countries are connected not only by a common political history, but also by the lives of many people who have both Russian and Ukrainian roots.